Living as I do on Rusty Metal Farm, which is sort of back to the land, I often think of my ancestors, who were true back-to-the-landers. They were on my maternal grandfather’s side of the family. A group of German immigrants who landed in New York and apparently decided the bright lights and big city vibe was not their jam. So, at some point in the mid-1800s, the Dielschneiders packed up what belongings they had into a covered wagon and joined the stream of people migrating west over the Oregon Trail. Sadly, that’s pretty much all I know about them. Other than that they ended up in Portland, Oregon, and one artifact remains of that overland crossing — a wooden high back chair that I suspect would have a few stories to tell if it could talk. Especially since I have since dragged it back east to the farm. The point is, they made it. Thousands of miles over some pretty rough terrain on what had to be one of the longest, most uncomfortable road trips ever. I have no record of that trip, no way to know if they got lost, stopped for directions, argued, were injured or came close to giving up. What I do know for certain is this — had I been driving the wagon and in charge of the trip we would have gotten lost, stopped numerous times for directions, argued, gotten hurt and thrown several temper tantrums demanding we turn around at once. There may be pioneer stock in my veins, but I’ve yet to tap it. Frankly, when traveling I do not enjoy discomfort. Don’t get me wrong, I don’t shell out thousands of dollars for first-class tickets on flights. But I have been known to save some extra pennies so I can at least upgrade. So months spent bouncing around on a rickety covered wagon in all sorts of weather? Speaking of bouncing around and discomfort, as anyone who has road tripped with me can tell you, there are a lot of stops at my request. Some for photo ops, but mostly for bathroom breaks. Lots and lots of bathroom breaks. When I head downstate it’s not unheard of for me to swing into one of the stores in Eagle Lake — 20 minutes into my drive — to use the restroom. Likewise, I can personally attest to the quality and location of restrooms in Portage, Ashland, Patten, Medway … Well, you get the idea. I don’t have this on any sort of historical authority, but I would be willing to bet bathroom breaks along the 19th century Oregon Trail were scheduled and quite limited. Then there is the real possibility that, had I been driving the lead wagon, we never would have gotten there at all. Not that I’m particularly proud of what I’m about to say, but I have gotten lost on my own farm. 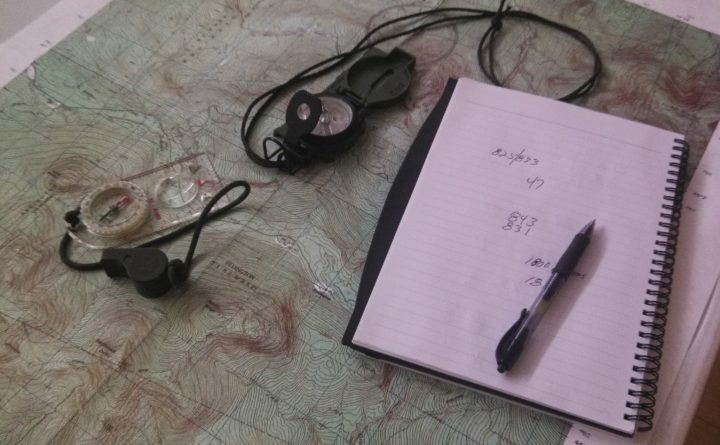 Over the years, people have attempted to teach me how to use maps (street and topographical), compasses, global positioning satellite technology, the stars and even a sextant. The only reason I get from point A to point B is a total unwavering willingness to stop and ask for directions. I was so lost driving in Boston one time I was ready to flag down a cabbie and pay him to lead me to my destination. Even when I am with people who use directional devices with success, I can cause trouble. On a trip from Quebec City to Montreal — something I have done several times with actual success by car — I managed to point my friend Julie, who was driving, in the wrong direction. “No problem,” Julie said, reaching over and activating her car’s internal navigation system, which gives turn-by-turn directions in a somewhat creepy female robotic voice. Five minutes later the robot was getting us heading toward Montreal, and I began questioning its every word. Long story short, the robot was right and I spent a bit of time sulking in the passenger seat. That is until I needed to ask for a bathroom break. Julie has since convinced me to make use of GPS technology when traveling, and I have to admit, when I let it have its way, it does get me where I need to be. Things did go somewhat awry, however, on my most recent trip to Quebec. I was driving along, chatting happily with Julie using the fancy hands-free phone technology on my new car when I blew past my exit and ended up in the middle of God know’s where industrial Quebec City. There were not even any places to pull off the road — just miles of concrete dividers with darkened factory-like buildings on the other side of them. Julie stayed on the line with me until I could pull into a service station and start breathing again. Which is about the same time I discovered that, for whatever reason, my car’s GPS would not work in Quebec. Can you say, “Je suis lost”? Fortunately, 1,200 miles away in Winnipeg, Julie’s smartphone GPS was working just fine, and after I read to her the street address at which I was parked, she plugged in my destination and talked me through the route. I will say, she was far less snippy and robotic than her car. And I only made two wrong turns in the process. So, hat’s off to my pioneering ancestors of yore. They headed west and actually made it. Maybe they would have brought me along, but frankly, when it comes to going back to the land, this girl gets lost even doing that.